The Robert M. Stecher Collection of Charles Darwin Books and Manuscripts is an outstanding resource for the study of Charles Darwin. It is an excellent example of what a knowledgeable and enthusiastic collector can do for scholarship. Over a period of thirty-seven years, Dr. Stecher collected both the works of Darwin and other 19th century naturalists and those writings that influenced Darwin’s thought. Over 175 manuscript letters by Darwin, his family and his contemporaries (such as A.R Wallace, Grant Allen, Henry W. Bates, J. Brodie Innes and many others) are also an invaluable part of the collection. These letters document Darwin’s daily life and reveal the struggle of the Victorians to formulate and accept the theory of evolution. These letters are available in a PDF format from Digital Case. Charles DARWIN (1809-1882) [Extracts from Letters Addressed to Professor Henslow] Printed for the Cambridge Philosophical Society, 1835. When Darwin returned from his voyage on the Beagle, he discovered that he was already well known for his work in geology. His friend and professor, John Stevens Henslow, had collected and extracted from Darwin’s letters to him during the voyage, especially his comments on his geological observations. He had them privately printed in 50 copies for the Cambridge Philosophical Society. It is considered Darwin’s first printed work. [Thomas MALTHUS] (1766-1834) Principles of Population. London, for the author, 1798. Dr. Stecher also collected works that influenced Darwin and added to his library the 5th edition of the Principles, the edition that Darwin is said to have read when formulating his theory of evolution. As a collector, however, he couldn’t resist collecting the first edition of 1798 and the first American edition of 1803. The 1798 edition was published anonymously on light blue paper and is exceedingly rare. 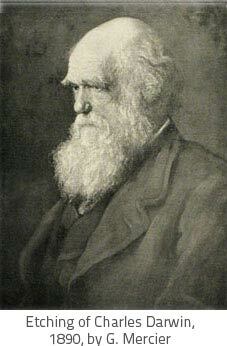 Charles DARWIN (1809-1882) The Origin of Species. London, John Murray, 1859. The collection contains many editions of The Origin and its translations. There are two copies of the first edition, first printing, the article written for the Journal of the Linnean Society by Charles Darwin and Alfred R. Wallace (1858), and many original reviews written, some in outrage, some in defense of Darwin’s work. Other items demonstrating the impact on the public include cartoons and sculptures satirizing our “new” ancestors, the apes, even though Darwin never discussed human evolution in The Origin at all.